I have been an art teacher for 16 years and have always been fascinated by the ocean, especially sharks. As an educator, especially one living so close to the ocean in Florida, I create lesson plans centered on the importance of our marine ecosystems, and try to draw attention to the vast biodiversity of species living beneath the waves. My hope is to inspire my students to tell the stories of the ocean through art. And there is no species that needs their story told more than ever than the shark. Around the world sharks are in serious trouble. Up to 73 million sharks are killed each year for their fins. This number is almost impossible to comprehend, but it has led to precipitous drops in shark populations. Why, just this week, a study was released that found reef sharks in the Pacific have dropped by 90%. As a teacher, I am always in need of materials to share with my kids for use in the classroom. These days, you can find quite a few shark-themed items marketed for kids. There are t-shirts, plush toys and even a remote controlled flying shark. But there isn’t much educational material geared towards kids that explain what sharks really do for the ocean or the imminent dangers that shark populations are facing worldwide. And when I started to research kid’s books and games about sharks they all seemed to perpetuate the shark as the evil villain with big sharp teeth, to be feared not understood. These weren’t the sharks that I wanted to expose my students to; these weren’t the sharks that I knew from personal experience. Frustrated by the lack of fun, friendly and educational kids’ material that were available, it became clear to me what my next step had to be. I decided I needed to write a children’s book. I wanted my book to be based on science, and I wanted children to be able to connect with my stories and to have empathy for the status of shark populations around the world, to have an understanding of how important they are for the entire ocean, so I decided that there needed to be a spokes-person, or spokes-shark, that could inspire the next generation to do something to protect shark species. Sharks need to be viewed for what they really are, essential and fascinating animals important to our ecosystem and not as the media usually falsely portrays them. 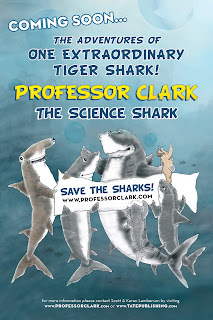 Enter Professor Clark the Science Shark. The life and adventures of this extraordinary tiger shark is documented and illustrated in a series of children’s books that the entire family can enjoy. 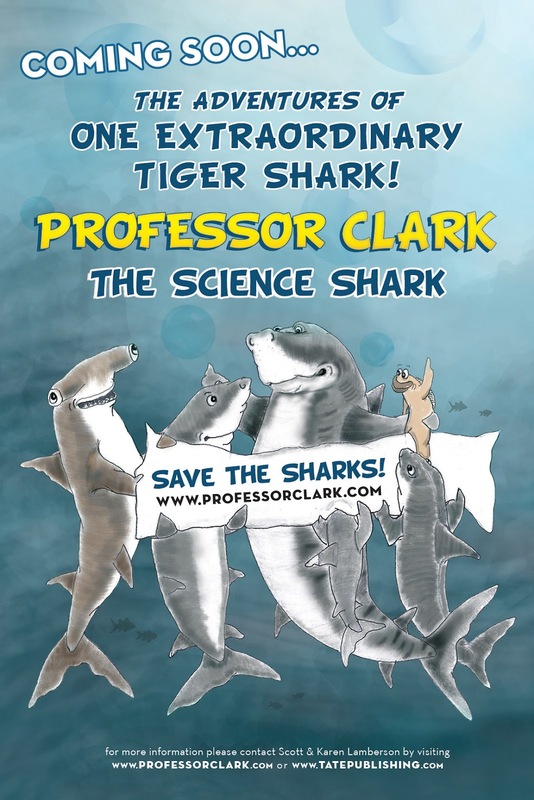 The books describe how a little tiger shark pup grows up to become Professor Clark and helps teach others about ocean ecosystems, their inhabitants, and of course his soon to be new friends, the humans. The beautiful images are all hand drawn and will transport you to the bottom of the sea with lots of other sea creatures to keep your imagination going. My storylines are poignant and reflect the messaging of shark conservation, backed by sound science, to determine the most important issues facing some 465 different species of sharks. I develop and write storylines in a way that makes them understandable to kids and ensures the stories reflect, as closely as possible, the natural world of a tiger shark, without losing the magic of an imaginary talking shark and friends, of course. And I am very excited that my first book is now ready to be shared! 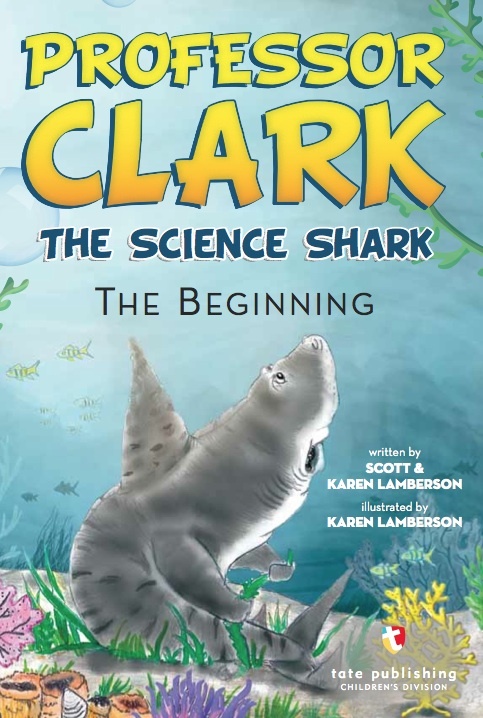 Professor Clark the Science Shark: The Beginning is currently available on our website and from Tate Publishing Company. I think with everyone’s help, we, along with one extraordinary shark, we can help save the sharks and the ocean. Please check us out, I guarantee my book will bring laughter, tears, and plenty of enjoyment to your entire family for many, many years! Karen Lamberson is an art teacher, illustrator, and author living in South Florida. The next two adventures in the series, Professor Clark: Going Home and Professor Clark: The Encounter are in the final stages of the publishing process and will be available later this summer. For more information on Professor Clark, visit his website at www.professorclark.com.